This spacious chalet apartment has a lovely and spacious open-plan kitchen, living and dining area. This apartment has been newly renovated to a very high standard during the summer of 2018. Chalet Astragle has access onto a private sun terrace with stunning mountain views. Chalet Fruitière is located within less than 40 meters from the main gondola in St Martin de Belleville. Connecting directly into the heart of the 3 Valleys. Is there anything better than to relax in front of a roaring fire after a long day skiing the world's largest ski area?! The master bedroom has access onto a balcony with mountain views. The master bedroom is nice and spacious with en-suite bathroom. All bathrooms are newly renovated - 3 have bathtubs and 2 walk-in showers. Chalet Astragle has two bedrooms with pull-out bed making it a triple room, ideal for children to share. This large Alpine chalet houses 3 apartments in total, when booked together these sleep up to 30 people. Chalet Astragle has been renovated to a very high standard this summer! The layout has stayed the same with a large open-plan kitchen, living and dining area on the ground floor. The kitchen will be extended and more open plan with brand new appliances. All in all the standard of this apartment is very luxurious! The chalet apartment ‘Astragle’ is one of three apartments situated in the traditional Chalet Fruitière. It has a ground floor entrance and spreads out over two floors. Astragle is the largest chalet apartment in Chalet Fruitiere with around 125m2 living space. It offers a spacious open-plan living area with a beautiful log fire, large dining table, comfortable sofas and a well-equipped kitchen. The large sun terrace makes an ideal place to enjoy a sunset drink and take in the mountain views. This ski apartment sleeps ten very comfortably and actually has two pull out beds if need be offering space for up to 12 people in total. There are two double and three twin bedrooms all of which have their own bathroom. To add to your holiday the chalet also boasts a boot heater for 10 pairs of ski /snowboard boots, ski lockers just outside the apartment door and a private underground garage. This fantastic ski-in ski-out location offers you a lot of flexibility during your ski holiday! 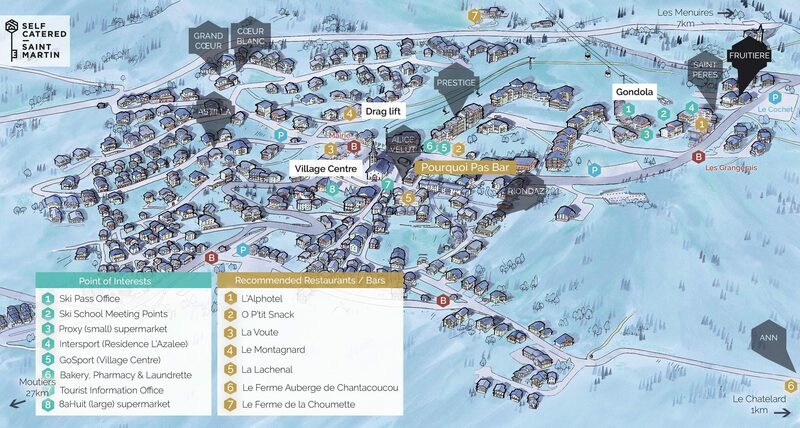 The main gondola is situated on your doorstep within less than 40 meters distance from Chalet Fruitière’s front door. Furthermore the ski pass office, rental shops, ski school meeting points, the beginner slopes, a couple of day-time restaurants and bars as well as a small supermarket are all located within a 100 meter radius – You couldn’t ask for more! The village centre can easily be reached on foot in less than 10 minutes. It’s a nice stroll through the village. There you can find most night-time restaurants and bars, a larger supermarket, the tourist office, further shops and a fantastic bakery for fresh croissants in the morning. The prices above allow up to 10 people in Chalet Astragle. A 11th / 12th person can be added (sleeping on one of the pull-out beds). Our ‘extra person fee’ is charged. Please contact us for your price quote! "Very well-equipped and cosy apartment in a great location - only a minute away from the main lift. We were able to ski back to the door. Nadine was very helpful in helping to organise our stay and providing little extras for us (the sledge was much appreciated!). The boot warmer was fantastic. We hope to come back again."